Sully Baseball: The 83 Fleer Project Guy is as crazy as I am! How awesome is the internet? The 83 Fleer Project Guy is as crazy as I am! How awesome is the internet? Let me direct my dear readers to something wonderful I stumbled upon on the internet. A guy who is as obsessive and thorough as I am. I thought my Best Home Grown versus Acquired team was intense. 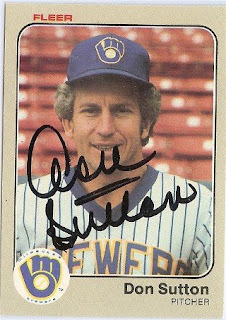 The creator of the 83 Fleer Project (whose name I can not find) is trying to get every single card of the 1983 Fleer set autographed. He has 433 out of 674 signed. And keeps an amazing blog of his progress. Let's hope he completes it. There was something brilliant about the 1983 Fleer series. I had always collected Topps cards. They tended to be the only cards sold at Richardson's Drug Store in Weston Massachusetts. But the other drug store across the street, the Weston Drug Store, started selling Fleer Cards in 1983. And for reasons not 100% known to me, I decided to buy Fleer that year. 1. They listed minor league stats no matter how many years in the bigs a player has played. Topps stopped listing minor league stats after 4 seasons. 2. The graphic layout was sparse. No fancy pennants or cursive writing. Just a gray border, the logo and what looks to me like Helvetica Font. 3. The pictures seemed like amateur hour. Almost none of them were action photos or those strange staged pitching shots that Topps would use. They were almost always with players in their batting practice jerseys with the stadium empty. They felt homemade and maybe for one season that was the appeal. 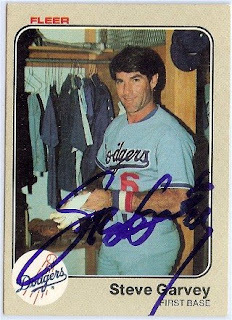 Scrolling through the site I realized how many of these cards I had... and how so many of the pictures not only failed to capture the glamour of the Topps cards but would probably be rejected by a high school year book editor. Let's look at some of the best ones! 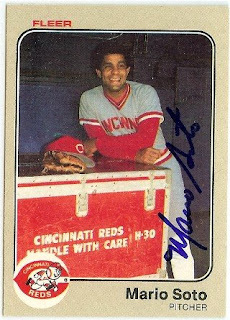 The photographer must have come up to Reds pitcher Mario Soto and say "Nothing captures the excitement of the game for a young child quite like leaning against a trunk that is kept in the locker room!" 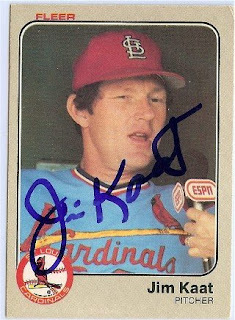 This one of Jim Kaat was one of the first 1983 Fleer cards I remember. How rushed was this photographer? He couldn't even wait for Jim Kaat to finish his interview with ESPN? How long was Kaat's answer to make the photographer say "Oh F this! I've got places to go!" CLICK!!? 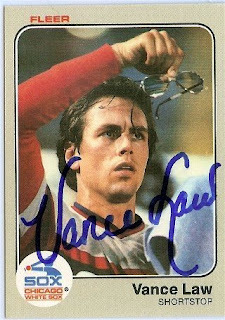 Here we see White Sox infielder Vance Law checking his glasses. Exactly how dull was the contact sheet of pictures that made the editor pick this one? "Well we have Vance Law checking glasses, brushing his teeth and taking a nap." "Better go with the glasses. But next time get him reading the newspaper!" EXCITING GETTING DRESSED ACTION with Dodger Superstar Steve Garvey! Seriously, couldn't you wait for him to... I don't know... get OUTSIDE? Ahhh the magic of Fleer! 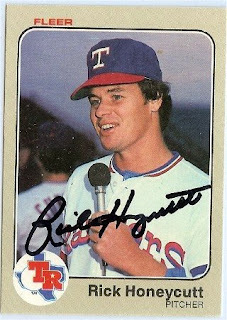 At first glance this shot of Rick Honeycutt looks like another interview. But look... it's Honeycutt holding the mike. And look at how happy he looks. He's in mid sentence... or is it MID SONG? I am convinced he is participating in Texas Rangers Karaoke! And seeing these pictures were taken during the 1982 season, I will guess he's singing a catchy poppy tune. My money is on Depeche Mode's "Just Can't Get Enough." 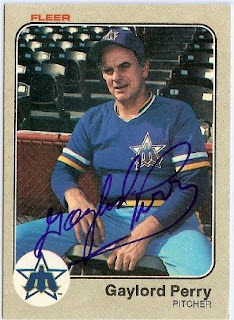 OK, Hall of Fame bound pitcher Gaylord Perry was 44 heading into the 1983 season. He was already an old baseball man. But was it completely necessary to get him slumped in a chair with an expression that reads "Oh my hip!" Seriously, is this a baseball card or the poster for Gran Torino? 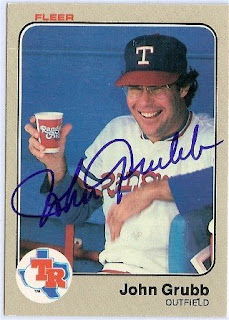 Here's Rangers Johnny Grubb doing a pitch for something that looks like Rangers Ale. I'm assuming that is a soft drink... although there is something wonderful about the concept of Johnny Grubb getting 'faced during a game. Either way, it's a good message for the kids! At first glance, it looks like Red Sox pitcher Chuck Rainey is grabbing his balls in this picture. Same with the second glance. Then on close inspection... yup still looks like he's itching his nuts. If you look really closely he is holding a ball... which he is rubbing on his crotch. 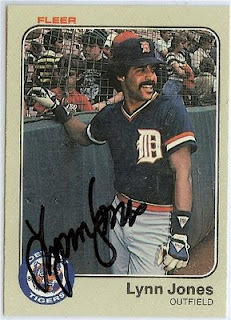 1) That this was the most appropriate picture to use in a baseball card. 2) I spent so much time looking at Chuck Rainey's crotch. Good luck 83 Fleer Project! It's this type of obsessiveness that the staff at Sully Baseball will always salute! Duane is proud of his broken bat! But what about the guy with the receding hairline and the Hawaiian shirt behind him? My Uncle has all of the autographs of the players in this set... except not all on their 83 Fleer Cards. My name's Luis Aponte. I'll sign said card LOL. That guy even has the same middle name as me. Photographic critique is in the eyes of the beholder. 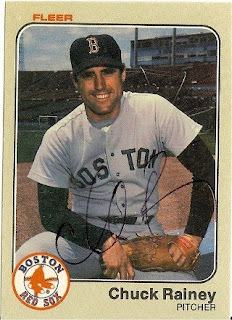 To me ugly cards are ones I can't read the fine print in the front or back or just play look ugly like the 1972 Topps. Hey Met fans... you got K-Rod... DUCK!